There’s one more Captain Trial to complete on Akala Island in Pokémon Ultra Sun and Ultra Moon, and that’s what we’re covering here. Captain Mallow is looking for ingredients to feed her friendly Grass / Bug Type Pokémon in the Lush Jungle area. The trial itself is pretty simple — if you pick all the right ingredients, that is! If you choose the wrong ingredients, you’ll have to deal with a deluge of angry wild Pokémon. This puzzling trial is pretty different from the original incarnation, and the Totem boss at the end of the road can be surprisingly difficult. Prepare yourself with a roster of Fire / Bird Pokémon to defend against the grassy insects that dwell in the deep jungle. After completing Kiawe’s Trial, travel down to Route 7 and talk to the NPC manning the tunnel barricade. The barricade will be removed — you can continue going, or stop and check out the rest of Route 7 in search of Water Type Pokémon. You can also grab some Fire Types from Wela Volcano Park — Mallow’s Trial is ahead, and she’s all about Grass Types. Through the tunnel, you’ll reach Route 8. The trial, your next goal, is in the Lush Jungle accessible from Route 8 — at the Diving Peak Tunnel, you’ll meet up with the Ultra Recon Squad again. They don’t want to fight this time! NOTE: Check out the Aether Foundation trailer in Route 8 — talk to the NPC inside near Vulpix and she’ll offer a sidequest to get a Big Malasada. You can buy a Big Malasada takout from the restaurant in Royal Avenue. Further in Route 8, if you follow the road, you’ll encounter a stranger — it’s Colress. He’ll give you a TM43 Flame Charge. That power will come in handy in the Lush Jungle trial ahead. The Ace Trainer past the Aether Foundation will give you the Sky Drop move for defeating all the trainers. Before reaching the motel and PokeCenter, there’s another optional area you can check out — the Dream Park. Not much here yet except a Totem Sticker. Past Dream Park, you’ll run into Hau again at the PokeCenter. Here, you’ll learn about Festival Plaza. Continue going south to reach Route 5. You can explore the route if you want, or enter the Lush Jungle right away. It’s next to the entrance when leaving Route 8. Before entering the Lush Jungle, prepare types of Pokémon strong against Grass Types. Bring Fire, Flying or Bug Types — there are others, but those types are common in Route 8 or Wela Volcano Park. 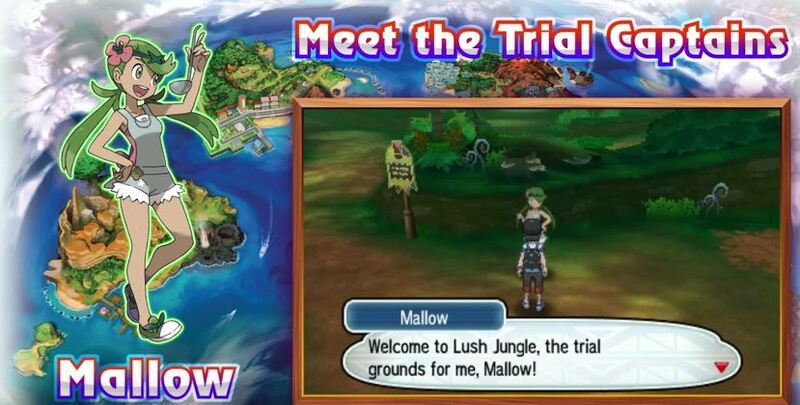 You’ll meet Mallow, the Grass Type Captain at the entrance to the Lush Jungle — she requests three ingredients. Mallow will show you to the Mago Berry grove. Interact with the glowing spots to grab Mago Berry — avoid the trunks that smell like honey. Collect the Mago Berry from the tree to the far left. It smells sour. If you don’t select the right spot to forage, Pokémon will appear and attack later. NOTE: Get the TM86 Grass Knot in the second foraging area. Look in the hole to the left. In the second area, collect the flowers in the lower-left corner. It’s described as having only a few flowers instead of tons or lots. In the third area, collect the Big Root from the fourth Sudowoodo — there’s no further description of it moving, so it’s safe to forage. Mallow tosses all the ingredients into her giant cook pot to create the Super Mallow Special! Captain Lana and Kiawe are here too. The smell doesn’t just bring friends, it’ll also summon a Totem Pokémon. Lurantis is a Bug / Grass Type, and will immediately summon a Comfey ally. Use a Bird or Fire Type to really dish out some serious damage — if you have Dartrix, you’ll have an easier time here. Lurantis can heal itself, and Comfey can change the weather. Lurantis’ constant healing is really annoying, so you’ll need to use Super Effective attacks to bring its health down before it fully heals. Comfey won’t just change the weather, it will also increase defense on everyone in the battle. He’ll increase your defense, but also Lurantis’. After defeating Comfey, Lurantis will summon Kecleon as an ally. Kecleon’s Ancient Power attack is more dangerous than anything Lurantis has for most Pokémon, so you’ll want to take it out quickly. Like all Totem Pokémon, if you defeat all its allies, it won’t summon more. For this fight, it’s best to deal with the allies then focus completely on the Totem Pokémon. For defeating Totem Lurantis, you’ll get the Grassium-Z Crystal, and 10 Nest Balls. After that, Professor Kukui shows up to give you TM67 Smart Strike. Next stop is the Dimensional Research Lab! You’ve finished the last Akala Island Captain’s trial. Time to go complete the Grand Trial!